According to volume one of From the Widow's Walk, by Helen Hansen & Virginia Steinemann, the Sloane House hotel opened November 17, 1881 and was razed in the early 1950s to make way for the Lasalle’s store. 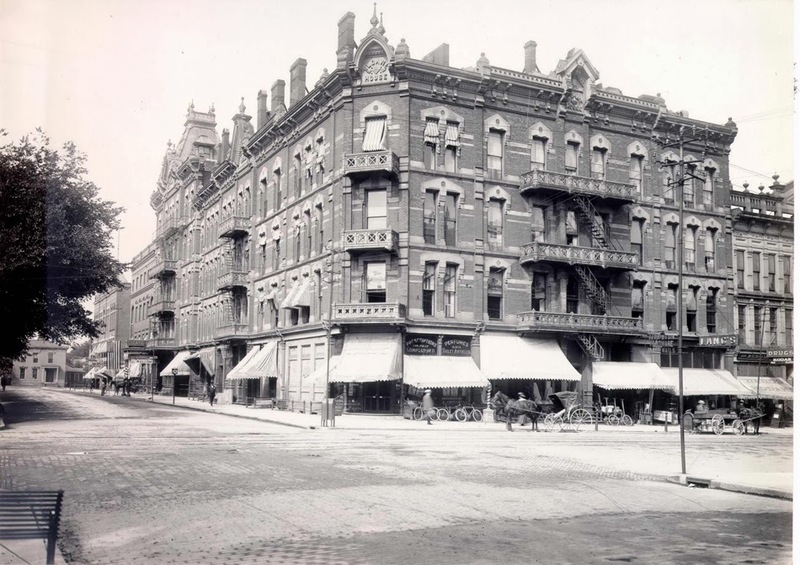 The four story brick building was located at the northwest corner of Columbus Avenue and Washington Row, now the location of Erie County offices. 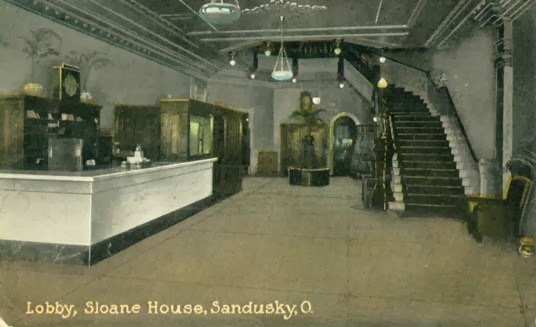 It was named for its owner, Rush Sloane, a well-known lawyer and abolitionist who served as Sandusky’s Mayor in the 1880s. 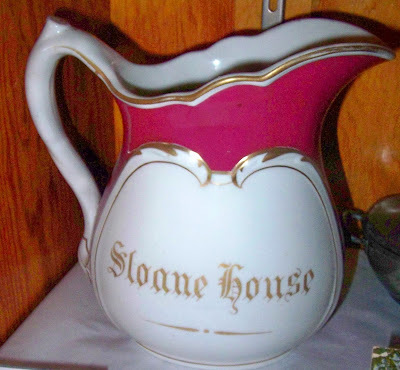 When it opened, the Sloane House furnished accommodations for one hundred fifty guests. The Sloane House was a popular gathering place for business meetings, wedding receptions, and family gatherings. Several businesses were in operation at the street level. A drugstore was the anchor store at the Sloane House for several years. Below, you can see a portion of the H.K. 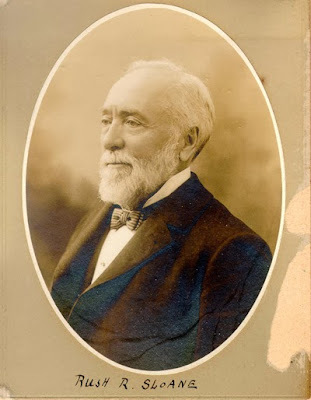 Henkelman and J.H. Bechberger drugstore in a picture from a wintry day in 1909. An article in the October 25, 1915 issue of the Sandusky Register reported that a play entitled “Emma McChesney and Company” used an exact replica of the lobby of the Sloane House as part of its scenery. A traveler told Sloane House Manager Charles T. Gauvey that when he saw the play, he was tempted to go on stage to go through the swinging door into the bar room, because it looked so much like the Sloane House lobby. 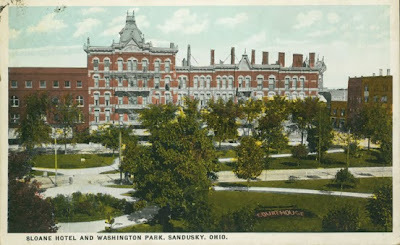 This postcard from the Alexander Manufacturing Company shows a view of side of the Sloane House that faced Washington Park. 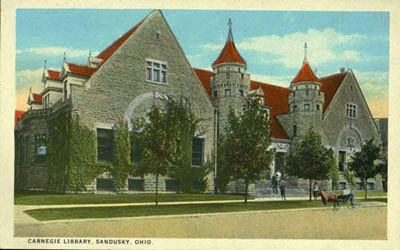 By the time this postcard was created by E.B. Ackley, visitors to the Sloane House could reach the hotel by automobile instead of horse-drawn vehicles. Several items from the Sloane House hotel can be viewed at the Follett House Museum, including this china water pitcher. I remember as a young teenager being in the Sloane House lobby before the building was torn down to make way for the Lasalle's Dept. store. IT was sad to see the old building come down, but it was exciting to watch the new Lasalle's go up, as it's modernistic architecture was such a radical departure form the old Victorian-style hotel. As a side note. 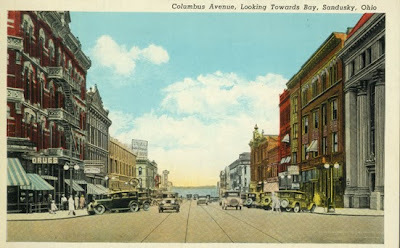 Rush Sloane moved the Cooke house off this property to its current location on Columbus Ave. The propery on which the Sloand House sat was the Cooke estate. Hi Ed, I was wondering if you had any information on the Rush R Sloane home on East Adams Street? This home is currently under restoration, but have no early pictures of the inside to help restore back to original as close as possible. Any information would be great!!! I wonder how many ladies courted and/or retrieved or won by the men of this era in an establishment like this. It is hard sometimes to imagine Sandusky being a thriving city with a bustling downtown, larger than Cleveland as some have said at one time. But these postcards show it really was a beautiful bustling city well on it's way to being someplace important. 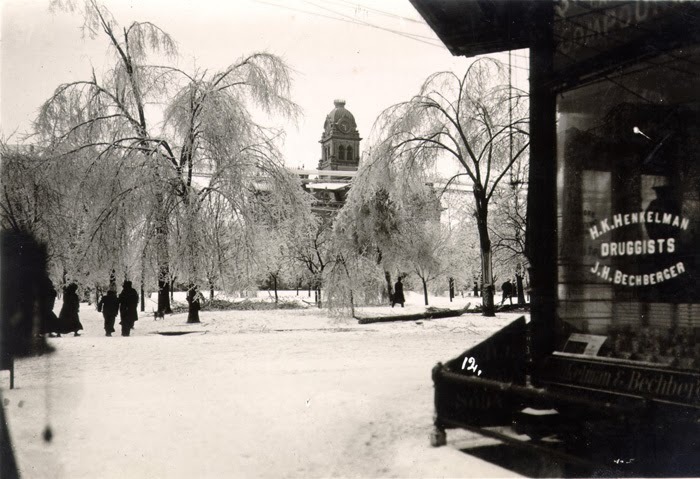 Although we have seen many years of emptiness and decay in our downtown, we are still struggling to make it a busy bustling place like those days. It is wonderful to see what our forebears achieved here and how beautiful and alive we can still make it, if the right choices are made in that endeavor. What a jewel that hotel was for our city, I wish I had seen it. It is a good lesson for current government officials and local residents to learn, not to tear down old buildings just because something modern can be put in it's place. the beautiful architecture and historical past of our city cannot be replaced, once lost. This city can never be a tourist attraction as a modern metropolis, but it can be an attraction as a beautiful historical city, with old architecture and fabulous water views and attractions to lure tourists in. We should work towards that.